Our coaches provide gymnastics instruction to all children of all ages and all skill levels. They create a fun-filled, high-energy learning environment, prepare class materials and lesson plans and keep kids learning and having fun! Programs include preschool gymnastics, girls and boys gymnastics, power tumbling, and girls and boys competitive teams. Full-time and part-time positions are available. Requirements: Must be loving, caring, fun, dependable, organized, have a positive attitude and love kids. ASI provides training. Experience with kids is preferred. Available on weekdays, weekday evenings, and/or Saturday morning. Our After School coaches supervise, coach and spend quality time with children after the school day ends. Coaches create a playful, educational environment where children learn, play and enjoy homework time, gymnastics lessons and games on the floor. Requirements: Must be high-energy, positive, love kids and have a desire to learn. ASI provides training. Experience with kids is preferred. Available on weekdays after 2pm on school days with some exceptions. 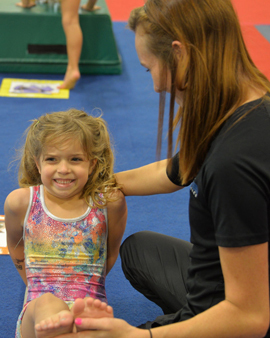 Gymmie Kids coaches help foster physical development through gymnastics instruction to special needs children. They use patience, creativity, and tenacity to get their students to strive for excellence. They create a fun-filled environment while helping students achieve short-term and long-term physical and behavioral goals. They are trained to modify ASI’s standard gymnastics curriculum to suit each individual child’s needs. Programs include shadow coaching and private lessons. Full-time and part-time positions are available. Requirements:Must be dependable, patient, and interested in helping children with intellectual and physical disabilities. Available weekday evenings and/or Saturday mornings. Previous gymnastics experience is not a requirement, as ASI provides comprehensive training to all employees. Willingness to coach other gymnastics programs, including preschool gymnastics and boys or girls gymnastics, is required. Interested in an internship coaching kids with special needs?